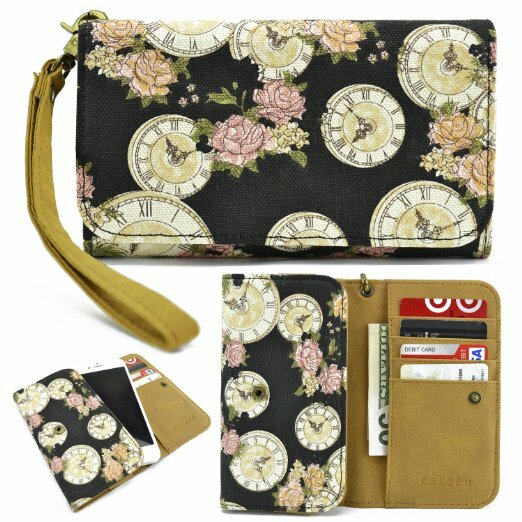 The Caseen Floral Clocks Women's Smartphone Wallet Clutch Wristlet Case is available in a number of colors and printed designs, making it a versatile option. Keeping your phone securely in place, the wristlet will also allow you to accommodate up to 4 credit cards and some cash. You can fit not only the iPhone 5 into this case but any smartphone that is up to 5" inches in screen size. The wrist strap is sturdy and easy to hold on to, making it easy to carry around.